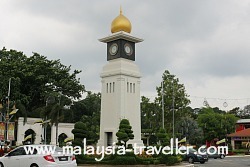 Kuala Kangsar Heritage Trail - Tips on what to see. 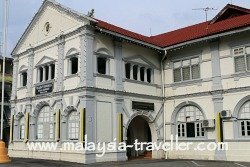 Welcome to Malaysia Traveller's self-guided Kuala Kangsar Heritage Trail, the best way to experience the highlights of Kuala Kangsar, Perak's royal town. The trail provides a full list of what to see. 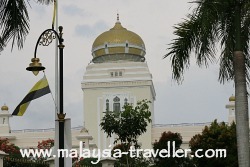 Kuala Kangsar is one of Malaysia’s prettiest towns and is packed full of palaces, mosques and other historical sites. This trail covers all the famous attractions and a few lesser known places of interest. Watch this short YouTube video to get a taste of what to expect. Kuala Kangsar is not a big town but its sites are somewhat spread out and this trail covers a distance of roughly 10 km. While I usually like to cover the whole distance on foot, I must admit that it was a particularly sweltering day on my recent visit and I traveled by car for some sections. I started my Kuala Kangsar Heritage Trail at the town’s spanking new railway station which has been built in preparation of the new electric train service which is scheduled to start later in 2015. That will make it much easier to visit Kuala Kangsar by train in future. 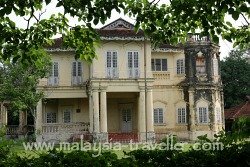 Going along Jalan Raja Idris takes you past a stately old mansion which has seen better days. This was the residence of the last Raja Bendahara until his death in 1953. It has intricate carving under the eaves and could be returned to its former glory with some careful restoration. 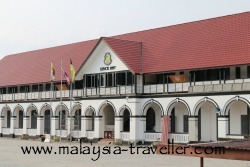 Next you cannot miss the sprawling campus of the Malay College Kuala Kangsar which was established in 1905 as a boarding school to educate the sons of the Malay elite. The school is sometimes referred to as the Eton of the East. There are a number of college buildings on both sides of the street arranged around football and rugby pitches. In the corner of one of these fields is the Pavilion which dates from around 1920. It looks like a cross between a Chinese pagoda and a Victorian bandstand. The clubhouse of the Iskandar Polo Club used to stand here too it burnt down in the 1950s. The pavilion appears to be losing a battle against old age and is in need of refurbishment if it is to survive. 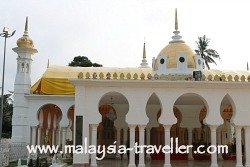 Next is the orange coloured Ridzwaniah Mosque built in 1980. It replaced an earlier version dating from 1915 which was no longer big enough. The Ridzwaniah may be the biggest mosque in town but it is not the most beautiful, in my opinion. 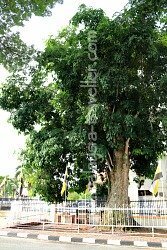 On the corner of Jalan Raja Idris and Jalan Raja Chulan stands a rubber tree which is claimed to be one of the oldest in the country, having been grown from one of the first 11 seeds introduced into Malaya in 1877. Rubber cultivation went on to become Malaysia’s most important crop. Next we pass the District and Land Office which was built in the late 19th century and contains the offices of the Deputy Public Prosecutor among others. Across the street is the Idris Club, which, during colonial times, was the main watering hole for British administrators and planters and the hub of the town’s social life, such as it was. The club featured in Anthony Burgess’ Malayan Trilogy novel, albeit under the assumed name Iblis Club. Idris Club was built in 1903. Read more on my blog. 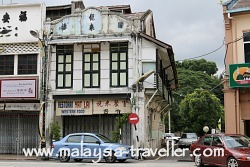 Turning into Jalan Taiping, we next pass the Post Office which dates from the 1930s. 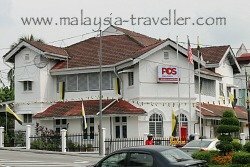 The Post Office in Malaysia owns many fine heritage buildings but this is one of the oldest and best preserved examples. In front of the Post Office, on a small roundabout, stands a very elegant clock tower with a golden dome. According to the dedication plaque, the clock tower was erected in 1939 to commemorate the coronation of King George VI (which took place in 1937). 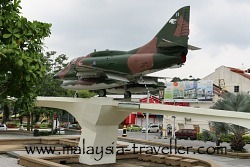 Nearby, standing guard over the town, is a Malaysian Airforce McDonnell Douglas A-4 Skyhawk mounted on a white plinth. This plane was presented to the Sultan of Perak in 2004 and put on display here. 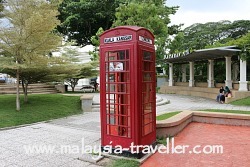 In the same vicinity is a landscaped public space, named Dataran Putra, with a fountain, some decorative arches and an old-fashioned British red phone box. The phone box has even been vandalised, making it look even more authentically British! 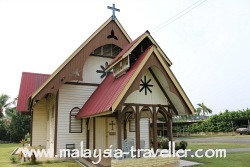 There is also a tourist information office here where you might be able to obtain a Kuala Kangsar Heritage Trail map. 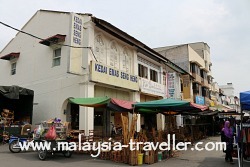 While in this location it is a good opportunity to explore the small commercial heart of the town with two or three streets lined with old shophouses. When I visited, on a Sunday, the alleys were filled with a busy street market. Some handicraft and souvenir products were on sale. 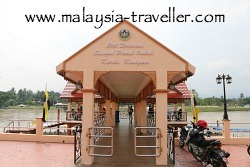 Down on the river front is a jetty where you can take boat rides across the Perak River to Sayong Crafts Complex or a tour up and down the river. 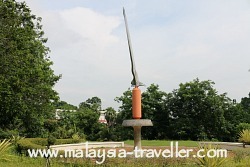 Crossing a pedestrian bridge where the Sungai Kangsar meets the Sungai Perak, takes you to a riverfront recreational park, called Cultural Park, which has a kiddies playground and landscaped gardens. 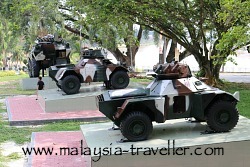 On the other side of Jalan Istana, the park continues uphill where there are some armoured scout cars on display, perhaps dating from the era of the Emergency. Nearby are some giant sayong pottery replicas. 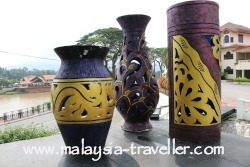 Labu Sayong is one of the local handicrafts, being a clay gourd-shaped jug used to store water. Not only does the pitcher keep the water cool but the natural clay is said to purify the water. The main sayong producing area is in a village on the other side of the Perak River. Continuing uphill in this park area, you will see the Rest House (a new build) and a Keris Monument erected in 1963 to commemorate the installation of Sultan Idris Shah. A little further up the hill is the King’s Pavilion, a mansion acquired by the British in 1878 to become the official residency of Hugh Low, the Resident for Perak. It was used for this purpose until 1905. Much later (1954) it became the Government English Girl’s School and today it forms part of the Raja Perempuan Kelsom Secondary School. 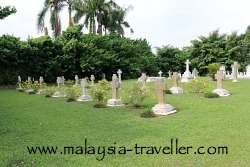 Returning to Jalan Istana, just behind the Rest House is a small road leading to a graveyard known as Bukit Chandan Cemetery. The sign at the entrance reads This Is A British Military Cemetery and it contains 16 military graves dating from the Perak War, 1875-77, and a number of other civilian graves from the town’s Anglican community. You can read more about this on my blog. Next stop is the impressive Galeri Sultan Azlan Shah, a museum housed in a former royal palace built in 1903 known originally as Istana Ulu (or Hulu) and later renamed Istana Kota. The gallery displays crown jewels, personal possessions of the royal family and other interesting items. Around the next corner on Jalan Istana is the Royal Mausoleum where the tombs of Perak’s Sultans and family members are located going back to 1887. It is built in Mogul style. Next door is probably Kuala Kangsar’s most famous attraction, the Ubudiah Mosque which was completed in 1917 and is thought by many to be the most beautiful mosque in Malaysia. The interior, with its cool marble courtyards is as stunning as the exterior. 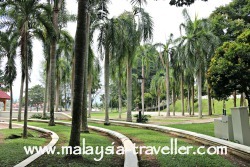 It was designed by Arthur Hubback who also designed the old KL railway station and many other famous landmarks. Another traditional wooden house is this one, which from the sign outside, appears to be called Baitul Noor. Across the street from Ubudiah Mosque is another school, this one a religious institution, Madrasah Idrisiah, which was built around the same time as the mosque to provide an education for the poor based on Islam. 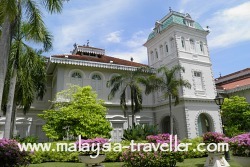 Mr. Ahmad Badawi, father of Malaysia’s 5th Prime Minister, was once headmaster at this school. Next Jalan Istana loops around Istana Iskandriah, Kuala Kangsar’s largest palace and home to the current Sultan. It was finished in 1933 and its Moorish art-deco design incorporates onion shaped domes. As an official residence it is not open to the public. 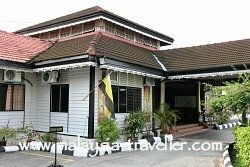 Nearby, the road passes Istana Kenangan (1926) which is one of Malaysia’s most attractive buildings, made entirely from yellow and black painted wood and constructed without use of nails. It used to house the Perak Royal Museum but its contents have been shifted to Galeri Sultan Azlan Shah and the interior is no longer open to the public. Heading back towards town you will see, off to your left, another fine wooden mansion, this one known as Baitul Rahmah, built in 1911. Head back to the town centre and turn left at the clock tower roundabout along Jalan Kangsar, another busy shopping street. One shophouse building of note is Yat Lai Restaurant with its balcony and original wooden shutters. The bamboo chicks say ‘western food’ but since the restaurant was closed during my visit I was unable to see inside. A few doors away is the Tsung Wah Primary School, established in 1911. It was closed during the Japanese occupation and was reopened in 1945. Across the street is Clifford School (1897), one of the oldest in Malaysia, and older than its near neighbour Malay College. The main building is currently undergoing renovation, including a new roof which makes it look younger than it is. A sign outside boasts the school motto ‘The Ship Is More Than the Crew’. Better not tell the crew! 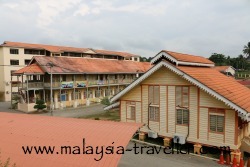 On the corner of the school playing fields is a small building which was Kuala Kangsar’s first hospital, built in 1890. The building was transferred to Clifford School in 1930. This completes my Kuala Kangsar Heritage Trail and you can walk from here back to the station if you are using the train. If you have a car though I recommend you take a look at Victoria Bridge which is located a few kilometres out of town at the village of Karai, near Enggor. This well preserved railway bridge has just celebrated its 115 year anniversary. 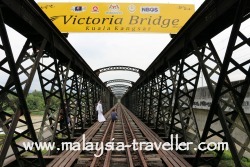 It is no longer used by trains (a new concrete rail bridge has been constructed alongside) but pedestrians and cyclists can still use this fine piece of Victorian engineering to cross over the Perak River. Read more on my blog. 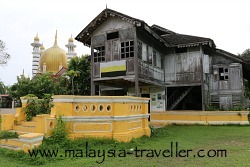 Hope you enjoy your Kuala Kangsar Heritage Trail. 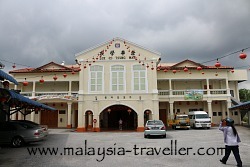 There are a limited number of places to stay in Kuala Kangsar. To see what is available and obtain discounted rates, take a look at Agoda’s website here.